Gillam, upstate New York: a town of ordinary, big-lawned suburban houses. The Gleesons have recently moved there and soon welcome the Stanhopes as their new neighbours. Lonely Lena Gleeson wants a friend but Anne Stanhope - cold, elegant, unstable - wants to be left alone. It's up to their children - Lena's youngest, Kate, and Anne's only child, Peter - to find their way to one another. To form a friendship whose resilience and love will be almost broken by the fault line dividing both families, and by the terrible tragedy that will engulf them all. A tragedy whose true origins only become clear many years later . 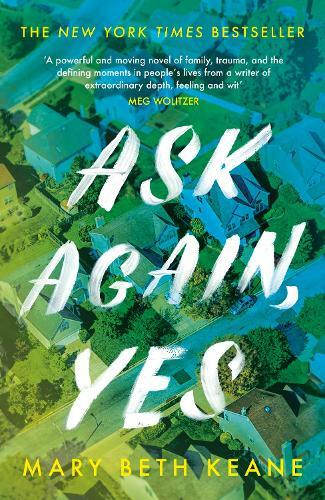 . .
A story of love and redemption, faith and forgiveness, Ask Again, Yes reveals the way childhood memories change when viewed from the distance of adulthood - villains lose their menace, and those who appeared innocent seem less so. A story of how, if we're lucky, the violence lurking beneath everyday life can be vanquished by the power of love.